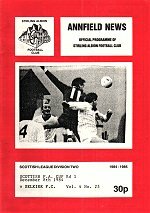 Not too many eyebrows were raised when on Saturday 8th December 1984 Selkirk AFC travelled to Stirling Albion in the opening round of the Scottish Cup. The non-league minnows had little to boast about in the way of success and had in fact dropped out of the East of Scotland League and had effectively folded at the time. In order to stay in the Scottish Cup, and to ensure future participation, the club fielded the players from Borders Amateur club Selkirk Victoria under their name. Despite the lack of success in 1966 they did have the honour of playing the French World Cup team in a warm up fixture before the finals that were to be held across the border that summer in England. The French players were playing for places in their opening fixture against Mexico and duly ran in eleven goals against the gallant Scottish Junior side. In return, Selkirk somewhat embarrassed their more illustrious opponents by scoring two of their own! But this was for real, the Scottish Cup is steeped with history and Selkirk wanted to be a part of it. As it turned out they helped write one of the biggest stories in Scottish Cup football this century. As the match progressed it became alarmingly apparent that Selkirk were no match for their Second Division opponents – goals came thick and fast. Stirling striker David Thompson helped himself to seven goals as Albion recorded the biggest margin of victory in a British senior (League or Cup) match this century, 20-0!